In statistics, a moving average or rolling average is one of a family of similar techniques used to analyze time series data. It is applied in finance and especially in technical analysis. It can also be used as a generic smoothing operation, in which case the raw data need not be a time series. A moving average series can be calculated for any time series. In finance it is most often applied to stock prices, returns or trading volumes. Moving averages are used to smooth out short-term fluctuations, thus highlighting longer-term trends or cycles. The threshold between short-term and long-term depends on the application, and the parameters of the moving average will be set accordingly. Mathematically, each of these moving averages is an example of a convolution. These averages are also similar to the low-pass filters used in signal processing. A simple moving average (SMA) is the unweighted mean of the previous n data points. For example, a 10-day simple moving average of closing price is the mean of the previous 10 days' closing prices. In technical analysis there are various popular values for n, like 10 days, 40 days, or 200 days. The period selected depends on the kind of movement one is concentrating on, such as short, intermediate, or long term. In any case moving average levels are interpreted as support in a rising market, or resistance in a falling market. In all cases a moving average lags behind the latest data point, simply from the nature of its smoothing. An SMA can lag to an undesirable extent, and can be disproportionately influenced by old data points dropping out of the average. This is addressed by giving extra weight to more recent data points, as in the weighted and exponential moving averages. One characteristic of the SMA is that if the data has a periodic fluctuation, then applying an SMA of that period will eliminate that variation (the average always containing one complete cycle). But a perfectly regular cycle is rarely encountered in economics or finance. For a number of applications it is advantageous to avoid the shifting induced by using only 'past' data. Hence a central moving average can be computed, using both 'past' and 'future' data. The 'future' data in this case are not predictions, but merely data obtained after the time at which the average is to be computed. Weighted and exponential moving averages (see below) can also be computed centrally. A weighted average is any average that has multiplying factors to give different weights to different data points. But in technical analysis a weighted moving average (WMA) has the specific meaning of weights which decrease arithmetically. In an n-day WMA the latest day has weight n, the second latest n-1, etc, down to zero. 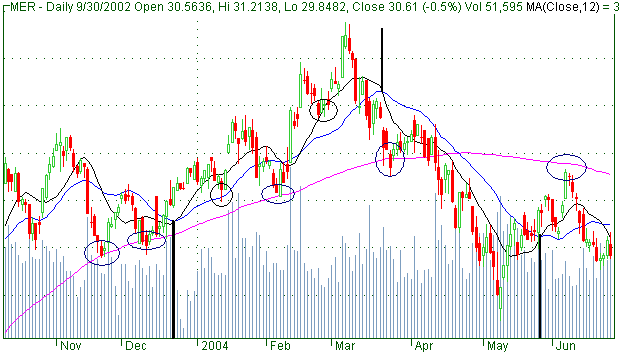 An exponential moving average (EMA), sometimes also called an exponentially weighted moving average (EWMA), applies weighting factors which decrease exponentially. The weighting for each older data point decreases exponentially, giving much more importance to recent observations while still not discarding older observations entirely. The degree of weighing decrease is expressed as a constant smoothing factor Multiplier, a number between 0 and 1. Multiplier may be expressed as a percentage, so a smoothing factor of 10% is equivalent to Multiplier=0.1. Alternatively, Multiplier may be expressed in terms of N time periods, where . For example, N=19 is equivalent to Multiplier=0.1.